We’d love your help. 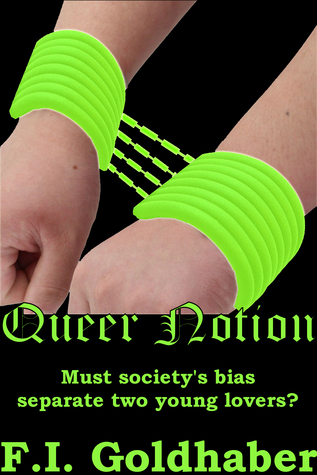 Let us know what’s wrong with this preview of Queer Notion by F.I. Goldhaber. Must society's bias separate two young lovers? Must society's bias separate two young lovers? ... Arrested for violating gender laws, Louie and Ryan must promise never to see each other again to avoid ten years in detention. Desperate, Louie researches the laws' history to find another option. To ask other readers questions about Queer Notion, please sign up. As a reporter, editor, business writer, and marketing communications consultant, F.I. Goldhaber produced news stories, feature articles, essays, editorial columns, and reviews for newspapers, corporations, governments, and non-profits in five states. Now, her poetry, fiction, essays, and reviews appear in paper, electronic, and audio magazines, books, newspapers, calendars, anthologies, and street As a reporter, editor, business writer, and marketing communications consultant, F.I. Goldhaber produced news stories, feature articles, essays, editorial columns, and reviews for newspapers, corporations, governments, and non-profits in five states. Now, her poetry, fiction, essays, and reviews appear in paper, electronic, and audio magazines, books, newspapers, calendars, anthologies, and street signs.